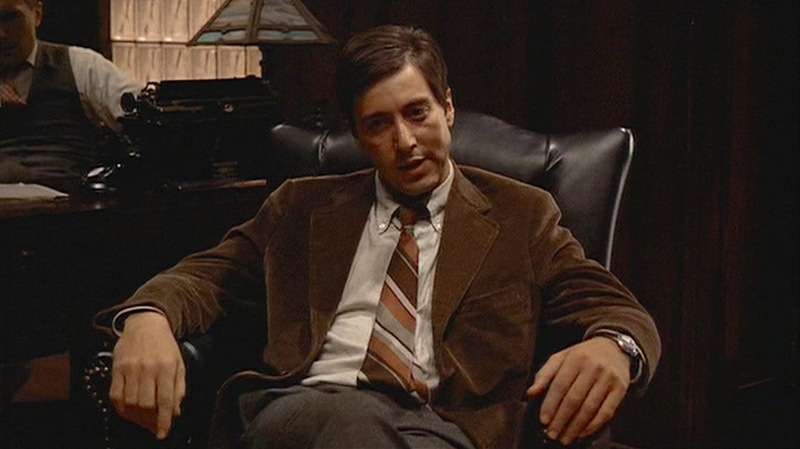 And the days are indeed gray for the Corleone family, particularly the recently returned Michael (Al Pacino). 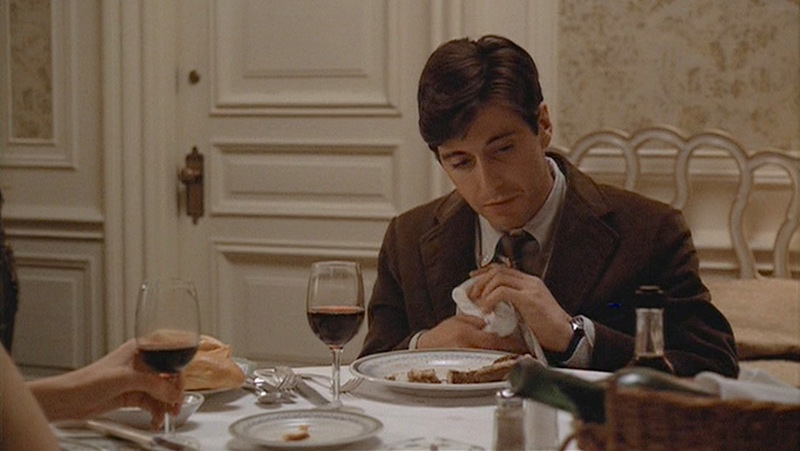 Things were going pretty well for a while, as the decorated Marine hero had just attended the wedding of his sister Connie (Talia Shire) and was looking forward to a comfortable life with his girlfriend Kay (Diane Keaton)… until his father, Vito Corleone (Marlon Brando), was shot and badly wounded by Mafia rivals. Now, a gloomy Michael is home for the holidays but has little to do other than hang around the family’s Long Island compound and learn a few family secrets about making sauce. He keeps his date with his girlfriend Kay (Diane Keaton), though the couple’s quiet dinner at the St. Regis does little to alter his glum attitude. Following their date, Michael goes to visit Vito in the hospital and discovers that McCluskey (Sterling Hayden), a corrupt New York City police captain, has dismissed the bodyguards. Sensing something wrong, Michael recruits the trembling baker’s son Enzo – who really couldn’t have picked a worse time to drop in on a family friend – to stand in front of the hospital until reinforcements arrive. They want to have a meeting with me, right? It will be me, McCluskey and Sollozzo. Let’s set the meeting. Get our informants to find out where it’s going to be held. Now we insist it’s a public place, a bar or a restaurant; some place where there’s people there so I’ll feel safe. They’re going to search me when I first meet them, right? So I can’t have a weapon on me then. 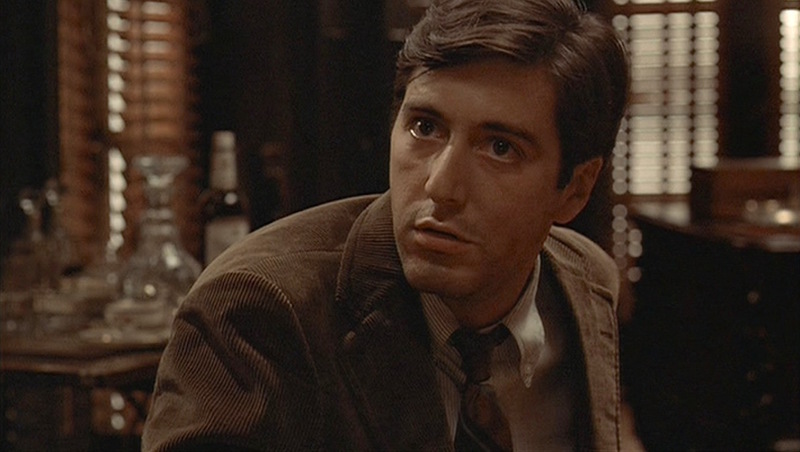 But if Clemenza can figure a way to have a weapon planted there for me, then I’ll kill them both. It’s Christmastime in New York, and the nip in the air means pulling out the coats and scarves. After wearing a brown overcoat and striped brown scarf for some holiday shopping with Kay, Michael ditches the scarf and instead pulls out a second, heavier brown topcoat that buttons up to the neck. 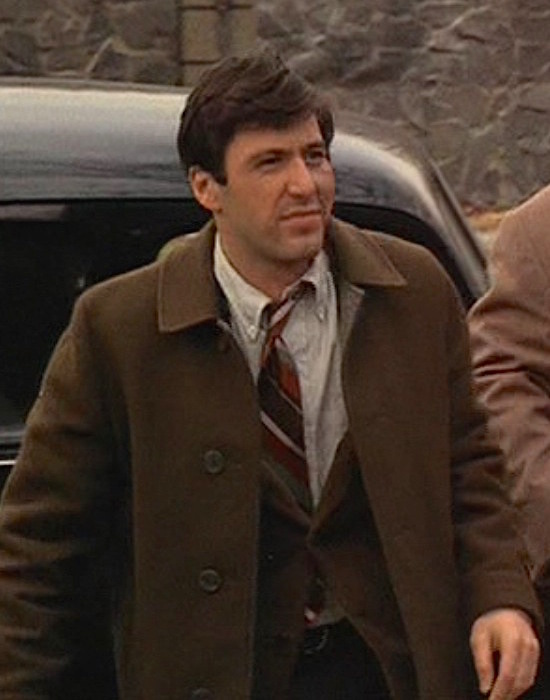 It’s worth noting that both of Michael’s coats before he gets more involved with the mob are a deep, earthy shade of brown, communicating a grounded sincerity. This brown napped wool coat has four widely spaced mixed plastic sew-through buttons up the front from just below his waist line to his neck, where the top button fastens under a flat, shirt-style collar. The coat has hand pockets and the cuffs are triple-banded with no buttons or fastening. 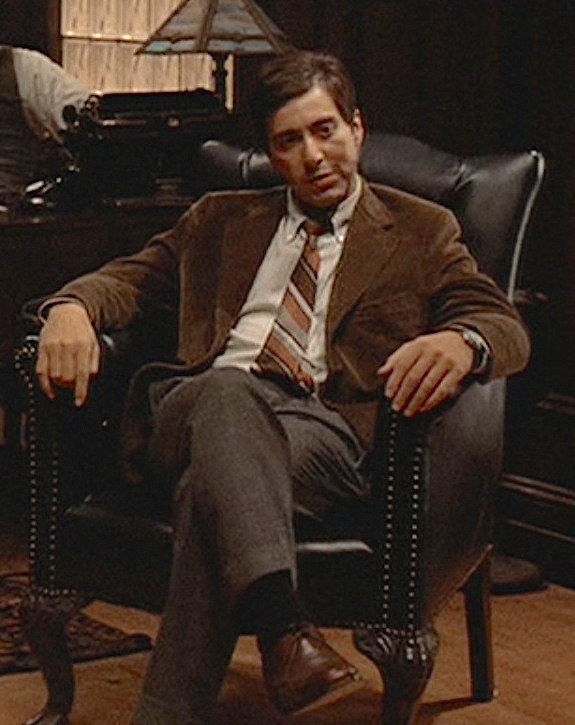 Ivy League style is a hallmark of Michael Corleone’s fashion sense during his brief “civilian era” between the Marine Corps and the Mafia, so noticeable that even his older brother Sonny can’t help but comment on it when Michael suggests taking a more active – read: murderous – role in his family’s activities. His brown pinwale corduroy cotton sport jacket is an Ivy style staple. The single-breasted two-button jacket has notch lapels, a welted breast pocket, and straight flapped hip pockets, all with swelled edges. There is a single vent in the back and two spaced non-functioning buttons at the end of each sleeve. Michael’s oxford-cloth cotton shirt with its button-down collar is another Ivy classic that’s far more collegiate than criminal in its associations. The hairline striping is dark navy on white, and it appears to be the same shirt he would wear with his charcoal flannel three-piece suit when executing Sollozzo and McCluskey at Louis’ Restaurant. The shirt has a breast pocket, front placket, and single-button barrel cuffs with mitred corners. The autumnal striped silk tie coordinates with the other colors in his outfit with “downhill” diagonal stripes of varying widths in bronze, brown, and gray. Michael wears a pair of dark gray flannel trousers, the pants that Alan Flusser refers to as “the blue blazer of cool-weather dress slacks” in his seminal Dressing the Man, commenting that “should you be considering a new sport jacket and are having difficulty visualizing it with a medium gray trouser, move on.” Michael’s gray trousers have turn-ups (cuffs) on the bottoms, and he wears them with a dark brown leather belt. The belt coordinates with his brown leather V-front derby shoes with two-eyelet lacing. These shoes and his black socks are Michael’s standard footwear with his civilian wardrobe. 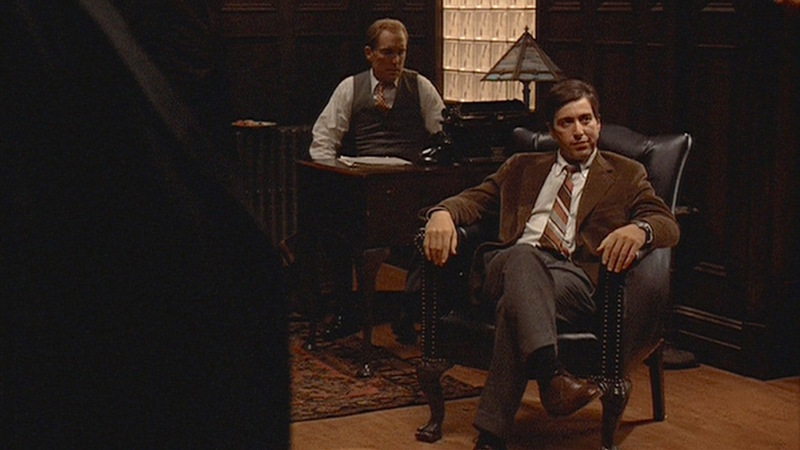 As Michael begins strategizing on behalf of his family’s criminal empire, he adopts a powerful yet comfortable position in his chair that would become his signature. Before he would graduate to the 18-karat gold Omega for his reign as Don of the Corleone crime family, Michael sported a much simpler timepiece, a plain steel wristwatch on a black leather strap. With its black dial, it could be a military watch – and thus possibly made by Hamilton, Bulova, or Elgin – that he may have retained from his wartime service in the U.S. Marine Corps. 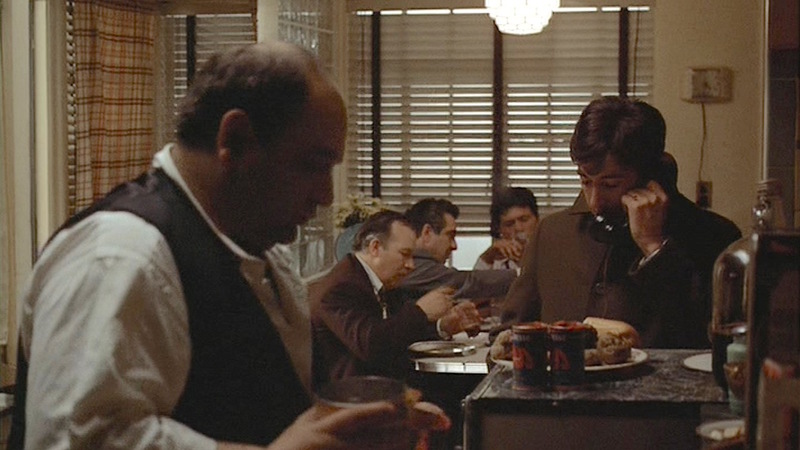 …and enjoy a home-cooked pasta dish with Clemenza’s signature recipe for Sunday gravy, which he teaches Michael after some gentle ribbing about his phone call with Kay. Come over here, kid, learn something. You never know, you might have to cook for twenty guys someday. You see, you start out with a little bit of oil. Then, you fry some garlic. Then you throw in some tomatoes, tomato paste. You fry it, you make sure it doesn’t stick. You get it to a boil, you shove in all your sausage and your meatballs, heh? And a little bit of wine, and a little bit of sugar, and that’s my trick. The Barefoot Clemenza at work. 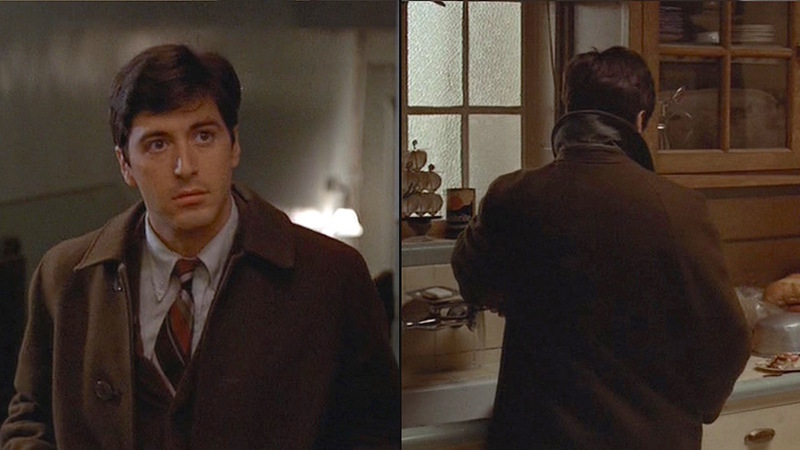 From the hotel to the hospital and back home again, this sequence features the last stand of Michael Corleone’s traditional Ivy-inspired style as he finally finds himself unable to resist the pull of his family’s criminal ventures. Check out the series and read Mario Puzo’s 1969 novel that started it all. 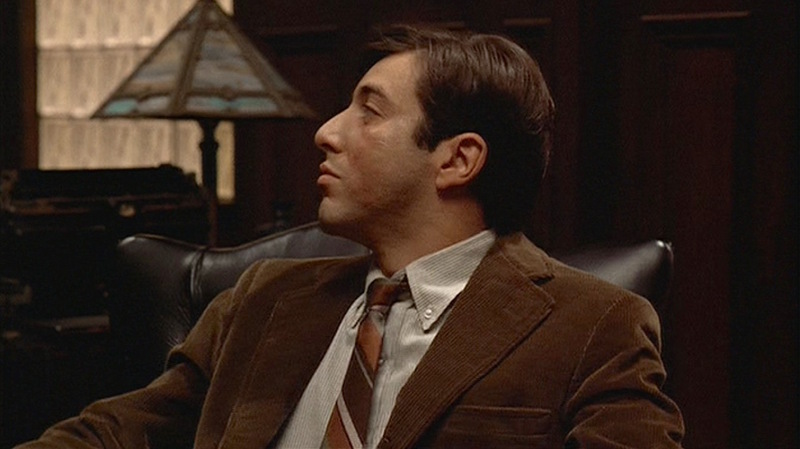 Could you make an article on Virgil Sollozzo’s suit and hat when he first meet Don Vito Corleone?